Rather a word of advice, a helping hand or an autograph, “sure, I got time,” were words Lane Frost lived by. Revered for his smile, his compassion and his love of Christ, Lane was a champion of life—a committed son, husband and friend—and forever known by all as a World Champion Bull Rider. Born in 1963 to Elsie and Clyde Frost, Lane began riding dairy calves as a young child—attempting his first bull at the scarce age of nine. Some sage advice from Don Gay steered his interests from bulls to steers and wrestling for a few years with great success, but by the age of 14 Lane once again turned his full attention to bull riding. Training with Freckles Brown, Lane became the Bull Riding Champion of the Small Fry Rodeo Association in 1978 with continued wins and titles throughout his high school career. It was during this time that Lane met his future wife Kellie Kyle and life-long friend Tuff Hedeman. 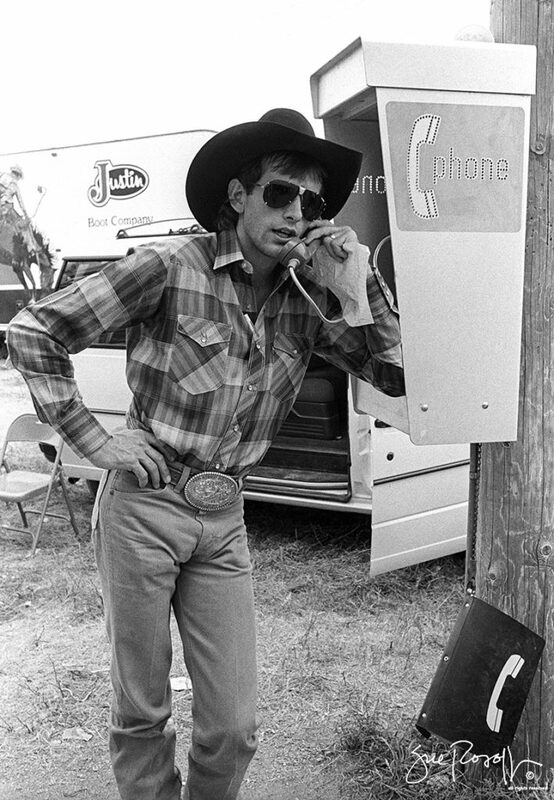 In 1983, at 19 years of age, Lane obtained full membership in the Professional Rodeo Cowboy Association (PRCA). A successful rise to the top, just shy of landing in the top 15 riders, earned him the title of Rookie of the Year runner-up. He also earned the PRCA Prairie Circuit Bull Riding Championship that year. In 1984 Lane officially qualified for the National Finals Rodeo (NFR), and over the next five years continued to qualify and rank in the top 10 bull riders. By 1985 Lane had secured another win in his life: he married and started a life with Kellie Kyle. In 1986 Lane was one bull shy of earning recognition as the first cowboy to ride all ten bulls in the NFR. Although he lost the championship to his good friend Tuff Hedeman, Lane earned fans far and wide. Red Rock, the bull who managed to slip through his grasp, was now squarely in his sites. Persevering through injuries and setbacks, Lane continued to build his life with Kelly while simultaneously training up and coming bull riders and pursuing the title of world champion. In 1987 Lane achieved his dream when he successfully rode eight out of 10 bulls and earned the title of 1987 World Champion Bull Rider at the NFR. Coming off of a high note in his career, 1988 proved to be a year of personal growth for Lane. A difference of opinion in lifestyle with his wife Kelly presented him the ability to grow and mature as a man and as a husband. As was consistent with Lane’s approach to achieving excellence, he rose to the occasion. And although there were many dates significant in Lane’s life, none was more so than that of March 8, 1988 when Lane became a born again Christian. On that day he accepted Jesus Christ as his savior and for his parents, Elsie and Clyde, this is the one thing they are most grateful for—his faith. That spring Lane set out to challenge the one bull he had failed to ride, Red Rock. It was a match up of all time: the 1987 World Champion Bucking Bull against the 1987 World Champion Bull Rider. Red Rock had a winning streak of 309 successful throws. No cowboy, including Lane, had ever been able to stay aboard for the full 8 seconds. In a seven-event match up Lane took the rodeo world by storm by winning the Challenge of the Champions. For a man so beloved by his fans, this event only served to further solidify his celebrity. By 1989 Lane felt stronger and more focused on bull riding. He began to spread his entrepreneurial wings and helped organize an event to honor his mentor Freckles Brown, while simultaneously signing on to work as a stunt double for the movie My Heroes have always been Cowboys. Life was moving at full steam as he headed out to the Cheyenne Frontier Days rodeo that summer. But it wasn’t just another rodeo. Sadly, it would be his last. On July 30, 1989 Lane would draw and ride his final bull, Takin’ Care of Business. An unassuming dismount and a muddy arena would play into the inability for Lane to get out of the bull’s way, taking two strong hits to his back and ribs. Although the horn did not break the skin, the assumption remains that his broken ribs severed an artery. It took only a few moments for Lane to pass from this life into the next. In those brief moments, Lane’s life on earth had come full circle. Celebrated for his incredible bull-riding career, including his 1987 World Champion Bull Riding title, it is Lane’s giving spirit and his love of Christ that best represents his life. Twenty-six years after his passing, Lane’s ever-present desire to help others lives on through the Lane Frost Championship Fund, his family, friends and fans. In celebration of Lane Clyde Frost: a dedicated son, a loving husband, a loyal friend and a World Champion Bull Rider!